Acer is one of the most prolific manufacturers we know, producing everything from huge multimedia powerhouses such as the Aspire Ethos 8951G to stripped-down budget models. 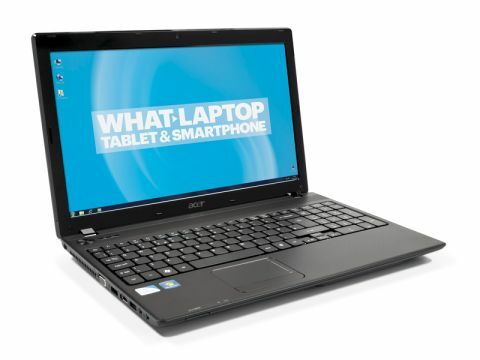 The Aspire 5742Z is one of the latter, and another strong entry-level contender. At this price range, you won't be getting the latest technology and performance will be limited. However, the 5742Z features an Intel Pentium P6200 processor backed up by a staggering 6GB of memory, much more than we usually see at this price. Only the MSI CR620 and Asus K52F performed better in our tests. We managed to write this review, stream music over the internet and back up our files all at once, with no slowdown at all. Applications started up quickly and ran smoothly. However, you only get basic integrated graphics to keep the price low. This means that you're limited in what you can do with your media. Browsing your photo collection and touching up images with basic editing tools are perfectly possible, and we were impressed that high-definition movies played smoothly. However, don't expect to be able to edit videos or play anything but basic or elderly games. You can watch DVDs thanks to the built-in optical drive, although the 5742z's speakers are far too quiet for enjoying music or movies. We recommend you attach an external pair. Thankfully, the 15.6-inch screen is fine for enjoying films, with sharp contrast and rich colours. If you want to work on a larger display, VGA and HDMI ports can be used to hook up an external television or monitor. Of course, you probably want a laptop for work as well as play, right? The Acer is a great option in this respect too, thanks to the firmly constructed keyboard which stretches the full width of the interior. Some may find the perfectly flat keys a little awkward at first if they're used to bevelled keys, which feature slanted edges. However, the keys are well sized, with the exception of the arrow keys which are flattened into a single row. You also have a separate numeric keypad to the right. The rest of the laptop is well constructed, although the palmrests do flex when you push on them. The lid is solid enough to protect the screen against any knocks. We weren't huge fans of the plain black design, but it doesn't look particularly bad. The 5742Z simply won't be winning any beauty awards. At 2.3kg, it's a lightweight laptop and would suit the regular commuter. The slim 35mm body slips easily into a bag or rucksack big enough to hold a 15.6-inch laptop, but make sure you pack the charger too. The battery died before we finished a two-hour film and only lasts half an hour longer if you limit your use to basic office software. Still, at least you can carry your entire media collection if you take to the road, thanks to the generous 640GB hard drive. This is the largest amount of storage offered by any laptop here, and something we would expect from more expensive mid-range models. The Aspire 5742Z offers strong value for money, although the poor battery life is a shame. If you want a highly portable laptop, the Lenovo IdeaPad S205 may be more suitable.